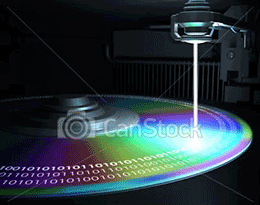 Two different processes are used to make CDs and DVDs. Knowing the difference can help you produce a product that better meets your needs and budget. Duplicaitonis very similar to the process of burning a disk on your home computer. The digital data either exists on your hard drive or is extracted from an original source (i.e., your original CD or DVD) and then stored. Then, in a separate process, it is written (”burned”) to pre-produced blank media and digitally compared to the original for accuracy (”verified”). The difference between duplicating your disks at home and working with Sound Advice is that we have large numbers of drives linked together allowing us to burn many disks simultaneously. We can also provide high-quality, direct-to-disk imprinting options not available on the consumer level. Replication is a manufacturing process that starts from scratch, using raw materials from which discs are made. First, a glass master is created, containing all the data that will be included in the project. Imprint artwork is transferred to film (one negative for each of the four process colors). The glass master is used to make a stamper which is then loaded into a complex, computer-controlled manufacturing unit. This machine forms the polycarbonate disc, applies the thin metallic layer (or layers) containing the data, adds a protective lacquer coating, prints the full-color imprint, and turns out a finished product, ready for packaging. There was a time when replication produced a more reliable product than duplication. However, that's no longer a concern on up-to-date playback equipment (less than, say, 10 years old). Still, each process has advantages and disadvantages. Economy. Because of the additional mastering and set up steps required for replication, duplication is typically less expensive for quantities smaller than 1000 pieces. For larger quantities, replication is the more cost-effective choice. Turnaround time. Because of the manufacturing processes involved, replication typically takes 7-10 working days while duplicates can be turned around in a matter of a 1-3 days. Imprint options. Prepress charges are typically lower for duplication projects. Like any printing process, full-color, direct-to-disk imprints are more expensive in small quantities. If you need some help determining which process is right for your project, give us a call and we’ll be happy to help.